It seems like October starts the season of fun activities. Scarlett is beside herself with excitement about Halloween this year. My mom bought these fun Halloween houses for Scarlett and Beck to decorate. They came out really cute. Unfortunately I did not get a picture of the final product, and seeing as how Scarlett has already eaten an entire wall of gingerbread goodness, there will be no picture to share. Believe me, though, it was a darling little house of candy corn and M&M overload. Last year, Brody started the tradition of carving a pumpkin with the kids. Technically, it's still with just Scarlett but Clark will join in soon enough! Sorry that some of the pictures are a bit blurry. I'm sure it has nothing to do with the fact that I dropped our new camera on the tile floor a couple of weeks ago. Thankfully, Brody found a repair shop. We'll know tomorrow if it can be fixed or if my Christmas present will be another new camera. Very fun. I am surprised she was bathed and clean BEFORE the pumpkin carving. She is so good to stay that way. 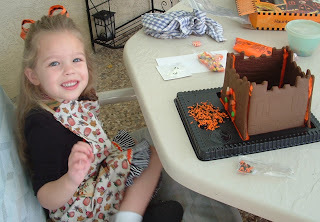 And the halloween house with Mimi was on my list to post about too. That was a fun project! 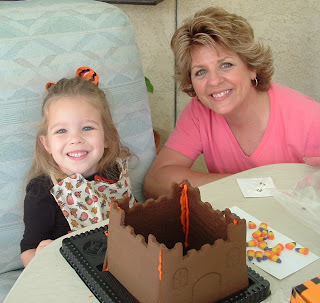 I can't believe I hadn't noticed till just now, but Scarlett sure does look a lot like her Mimi!